When Is a Product Really "Gluten-Free"? 7 Ways To Know | Great gluten free recipes for every occasion. Last time we had one of our chats, we talked about risks of getting glutened out there in the world. Risks that we couldn’t avoid, since we have to live our lives and all. But I think I goofed. I could tell by the comments that something was lost in translation. Since I have this thing about going on and on (and on) on the blog (I don’t like to do it), I didn’t say too much in the post. I just sort of jumped into the list. My point, which was sadly lost in the shuffle, was that we all feel some of these concerns sometimes, but there’s only so much we can do. And it’s really okay. Instead, I’m afraid my words seemed to come off like the ravings of a lunatic. Now I don’t deny being a lunatic. But the last thing I wanted to do was stoke fears. I wanted to quell them. I never want to make things harder on you. It’s not an exaggeration to say that I get up every morning trying to think of what might be fun for you to learn, how I can try to make things easier on you in my own small way. And honestly how I can make you laugh, which might be my most favoritist part of all. Just generally – how I can help. 1. The label on the product itself says “Certified Gluten Free” by GIG or the Celiac Sprue Association. Slam dunk. I’ll take 2. 2. The company, whether big or small, has a website with intelligent, articulate information about gluten in its products. It indicates whether individual products contain gluten, are manufactured in a facility shared with gluten-containing products and/or are manufactured on shared equipment with gluten-containing products. Thank you, smartphone, and your fancy Internet-anywhere access. 3. For big, well-established corporations: the label says “Gluten Free,” regardless of whether or not there is a certification. Companies like General Mills are big enough to afford testing, tout their gluten-free-ness all over the ding-dong place and would be perfect fools to fail to put their money where mouth mouth is. They know what’s at stake. We’re a big market already, and growing bigger every day, yo. 4. The company is one that you know practices “truth in labeling,” and has a “CONTAINS” statement which indicates the presence of any of the top 8 food allergens as defined by the U.S. Food & Drug Administration (milk, eggs, peanuts, tree nuts, fish, shellfish, soy & wheat). “Gluten” is a broader category than wheat, but “truth in labeling” companies will not hide gluten in things like “natural flavors” without indicating that. Kraft is one such company. 6. You tested a product with a home gluten test like EZ Gluten and it came up clean. Except there’s no way I’m doing that, on account of it costs a million simoleons. I’ll just abstain. 7. It’s really and truly naturally gluten-free, like water. Or vegetables. Or air (except in a flour factory). 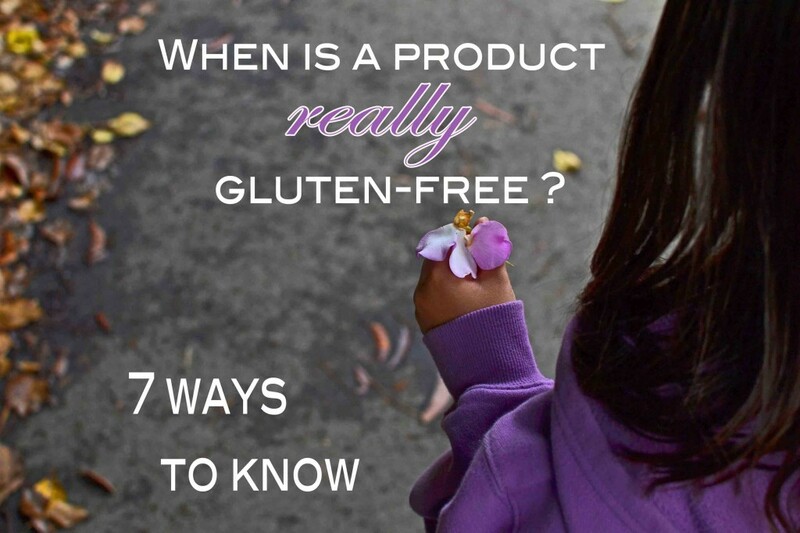 How do you decide if a product is gluten-free? P.S. If you buy a copy of My Cookbook, I still won’t be able to afford those fancy EZ Gluten tests (who really can?) but with any luck I can afford more recipe testing. Thank you so much for your support! Thank you, thank you, thank you for your blog. I began the gf journey in March and was pointed to your amazingness soon after. My learning curve has been steep, but you have eased the transition. I am heading to amazon to buy a copy of your book for myself. Btw, if you haven’t already written a post on it, I’d love to hear your ideas on traveling gf. I am in week three of six of a road trip visiting family and find myself miserable at least once a week. It that roller coaster learning curve! I’m so glad you’re here! I am honored to have been a part of these early days for you. The learning curve is, indeed, steep, but it does end (or taper off). I haven’t written a post about traveling GF, actually, but my family and I went to California for 2 weeks this past July, so I should indeed write something while it’s still fresh in my mind. Thank you so much for picking up a copy of my book! It makes all of this possible. You crack me up!!! And that’s only one of the reasons I read your blog! You provide great information; I’m always learning something new. And the recipes I’ve tried have been YUMMY!!! PLEASE… keep up the good work! Definitely have to watch the unlabeled things. Our son always broke out when we put sunscreen on him. Always drove us nuts until we found out about his wheat allergy. I talked with various sunscreen makers earlier this summer and was quite pleased with the Coppertone customer service. They have two gluten free/corn free sunscreens – Sensitive Skin and Water Babies Pure & Simple. The company is considering labeling as gluten free!! As for Kraft, I had a very unpleasant discussion with a “representative” about corn in a bbq sauce. She would not tell me because it was “proprietary information”! Gluten is becoming easier to avoid – just wish it were so with other allergens. Speaking of contamination… It did not occur to me until a friend mentioned it today but pet foods can contain gluten and contaminate a home. The kibble I feed my dogs is gluten free but not all of their treats are! You are not a lunatic or I am because I followed exactly what you were trying to express. It is absolutely true and unless you wear a mask and gloves and totally cover you skin you are bound to come in contact with a certain amount of gluten. All you can do is take as much precaution as humanly possible to avoid contact with gluten sources. To echo Doris’ comment – I have read that to earn a gf label a food has to contain <20ppm of gluten. Not 0ppm… <20ppm. That is still gluten and still dangerous to many people. Be very careful! And to Margaret – I am allergic to dairy not only when I ingest it but when I come into contact with it. Finding hair and skin care products that are 100% dairy free is pretty difficult because I also insist that products be 100% cruelty free. You can bet I know when a company has cheated! Contact dermatitis doesn't lie nor does it make you any friends when people think you're contagious. I’m definitely a lunatic too, especially when it comes to my four-year-old daughter’s health. Nice to be in good company! Looking at your list I got nervous about companies that practice “truth in labeling” – how do you know which companies do this and which don’t? According to our nutritionist at Columbia celiac center, as long as the food label doesn’t list “wheat, rye, barley, malt, oats” as ingredients it’s safe… She said it was an FDA law to list any of the allergens in the ingredients. Because of this I also thought “natural flavoring” was okay unless it specified it contained wheat. Oy! I feel like the learning curve to this never ends. I wish there was one definitive place to get all this crucial information, but in the year+ since my daughter’s diagnosis, I feel like I’ve heard and read a lot of varying and conflicting info. Want to remind everyone not to forget that if something is “certified” gluten free that doesn’t mean it’s 100% gluten free. Since I can’t ingest any gluten (even .0000whatever), I look on the label for the statement “processed in a gluten free environment on dedicated gluten free machines”, before I consider eating it. Thanks for all your helpful tips and delicious recipes. Use your cookbook almost every day and looking forward to your next one. Thanks, Doris, for your support in picking up a copy of my cookbook. It means so much to me! Great points! I also embrace your lunacy as you do mine. And that flower and cute little hand got me a bit misty eyed too. 44 grams is a about 3 TBS (3.08). I bought a scale (after hearing from Nicole that it was so much better than measuring) for 20 bucks and it is the BEST thing ever. Instead of dirtying a bunch of measuring cups and spoons, you set your bowl on it and zero it out each time you add an ingredient. It is so fab and my kids love using it too. Thanks for jumping in, Kristi, and singing the praises of baking by weight! Unfortunately, 44 grams of cornstarch is not 3 tablespoons. Weight-to-volume conversions are not at all accurate unless the calculator allows you to specify what sort of substance you are measuring. Since cornstarch is very light/volume, 3 tablespoons of the stuff is only 24 grams. 44 grams does not fit neatly into any particular volume measurement, really. If you figure about 8 grams per tablespoon of cornstarch, 44 grams is about 5 1/2 tablespoons. But instead of all that, I’d either use regular all-purpose flour or just get a scale! Kristi, You are so smart! When I weigh ingredients, I take out all my tiny glass bowls and dirty them all! From now on I’m going to use your one bowl/tare method!!! I just wish I could find a very accurate Food Scale. Because mine only weighs in 1/4 increments. So, it could be 44grams, or it could be 44.24 grams….until it hits 44.25 it doesn’t go up to the next quarter. Baking is Chemistry after all. I use an Escali scale (you can find the exact model I use in my “Shop” link), and, mine is actually only accurate to a gram, not a fraction of a gram. I have many times considered buying a highly sensitive scale, such as a jewelry scale, that is accurate to 1/10 gram. They do exist, but they only measure very small amounts. What that means is that you would have to use 2 scales – one for small measurements, one for larger (cup) measurements. One would be accurate only up to a certain total weight, the other only down to 1 gram. The main thing stopping me from doing that is that I pretty much know my readers won’t follow suit, so I go with volume measurements for very small amounts. I think it’s more realistic for people. I wouldn’t worry too much about a fraction of a gram, to be honest. The main reason to weigh ingredients is that, when people measure cups of dry ingredients, the weight varies wildly — often by 1 to 2 ounces (and 1 ounce weighs nearly 30 grams)! Yes, it is chemistry, and accuracy is important, but those tiny amounts aren’t normally going to make a difference in the final tally. Thanks for talking me off the ledge Nicole. I was looking at Escali’s this morning. I know that volume measurements that come in a cup vary also based on how you were taught to measure. Do you fluff the flour before you measure it? Pack it in? Use a knife to level it etc. So weighing really is best. But your right, sometimes I can get too Neurotic. I don’t fluff or pack or anything else. I weight. Every cup of flour. If you do want to measure by volume, never pack. Fluff, scoop, level off. But really just use your scale! It doesn’t much matter how you measure by volume. It won’t be reliable. Nik! thank you for that clarification on converting! I had no idea. I just weigh so I don’t have to worry. However, I do try to convert some of your recipes from your first book so now I realize I need to be careful! Thank you so much, for all that you do. My oldest son was diagnosed with Autism, Asperger’s Syndrome to be exact, in the Spring. We decided to try a gfree lifestyle(for everyone) instead of medicating him. It was unbelievably overwhelming at first, but with a whole lotta reasearch, and the help of a few(thousand!) cookbooks from the library, I’m feeling pretty good about my choices these days. Thank goodness I like to cook! I’m experimenting with the different flours available in my area and I think I’m getting the hang of it. It definitely helps to know that there are other mama’s out there who know what I’m going through. Can I add a comment? I hope so because here it is. Besides food, for me gluten free hair and skin products are important. I do not want to describe to you how my skin reacts to products with gluten. And I promise you don’t want to hear it. But companies who make those products are not bound by the same rules as food companies so it can be much harder to tell if a product is truly GF. So I contact the company. And then I get a standard answer. “We have consulted physicians who assure us that gluten on the skin cannot be ingested and cause digestive issues.” Well, company who makes a product I put on my skin, I was not asking what would happen if I ingest it. Companies who give me a standard answer that imply no real thought in preparation for a true answer are immediately put on my Do Not Spend My Money There list. You bet you can add a comment, Margaret! There is a saying in the Celiac Community that I’m rather fond of “Eating Out is Dangerous.” I feel like a nudge when everyone leaves the restaurant choice up to me because I have to trust the restaurant to understand my needs. There are very few of them, mostly big chains. I have been excited since the new labeling came into effect that I don’t have to avoid ALL Modified Food starch etc. However, last night my husband had a can of Hormel Chili…and even though it had Wheat and Soy, it had no “CONTAINS:” statement!!! Hormel has a really nice site about what is and isn’t gluten free, but they don’t follow through on their packaging. So, eating in can be dangerous if you are eating pre-processed food! I made Nicole’s yellow cupcakes last week and put fluffy nutella frosting on them. ooo-baby, they were AWESOME! So, I like that you are a lunatic, makes me feel right at home! I also like that you make me laugh. Plus, I like the recipes, and the cookbook, which I own — I’ll like the new one, too, can’t wait to buy it! You are the best, Nicole! Aw, shucks, Anneke. Takes a lunatic to love a lunatic, I guess. I hope that the cover art for the new book will be up on amazon very soon, so that I can do a real post revealing the cover and talking about the contents. I can’t wait! Release date is October 16, so if you order online, you will get it before the pub date of November 6. Woohoo! Karen, one more thing to look when buying gluten free foods. I’ve noticed a lot of companies will label things gluten free but will have the ingredient “distilled vinegar” which we all know is made from wheat! Ugh! Companies don’t have to label sub ingredients. So be careful!! Hope this helps! Distilled vinegar is gluten free, as are all distilled spirits. That’s why you can have a rye & coke, but you can’t have it with a corned beef on rye sandwich. The only vinegar that contains gluten is malt vinegar. Even if that was accurate, most vinegars use a base of malt vinegar. And malt vinegar is made from barley. The only vinegar I have had any luck with is apple cider vinegar or true balsamic. This is accurate, Linda. Thank you for clearing that up. If anyone has had a reaction to something that contained 100% pure distilled vinegar (regardless of the source), you were reacting to something other than the vinegar. Malt vinegar is not gluten-free because it is not distilled. See this article from Ann Whelan of Gluten-Free Living Magazine. We have her to thank for clearing this up, once and for all. Yes, I agree that you do have to be very careful, Shannon. But any vinegar that is 100% distilled is gluten-free. But that doesn’t mean that gluten can’t be “hiding” in other ingredients, for sure.